Well, if you agree that anything published before the year 2000 is old, and anything from before 1950 is ancient, then I have something for you.
. . . the works written by Alfred Aloysius Horn at the age of seventy-three, & the life with such of his philosophy as is the gift of age and experience, taken down and here edited by Ethelreda Lewis; with a foreword by William McFee. New York, The Literary Guild of America, Inc., MCMXXVIII. Alfred Aloysius “Trader” Horn (born Alfred Aloysius Smith; 1861–1931) was an ivory trader in central Africa. He wrote a book, Trader Horn: A Young Man’s Astounding Adventures in 19th-Century Equatorial Africa (ISBN 1-885211-81-3), detailing his journeys into jungles teeming with buffalo, gorillas, man-eating leopards, serpents and “savages”. The book also documents his efforts to free slaves, meet the founder of Rhodesia, Cecil Rhodes, and liberate a princess from captivity. I’ve read that book. I may have it around the apartment somewhere. It’s rather a fantastic tale of 19th century Africa, something straight out of H. Rider Haggard, and it became a sensation is the 1920s when it was made into a film using a lot of actual footage of wild animals shot in Africa. Some of that footage was recycled into the Johnny Weismuller Tarzan movies. What people don’t know is that after the success of his first book, Horn thought he could do it again by creating a medieval romance about the days of Viking England. He chose as his hero a 16 year old boy with webs between his fingers and toes, which made him a very good swimmer. The tale is the most ridiculous claptrap anyone has ever read. Horn called upon his family traditions from Lancashire, and thought he would make up a tale of derring-do that would catch the fancy of the romance-reading public the way his first story about rescuing a white woman from a native tribe did. Although the book was handsomely produced, I’m sure it sank like a stone when it came out. The tale involves a crew of teenage pirates sailing in British waters at the time when Julius Caesar was invading England. They spend some time with the legendary Irish chieftain Fingal and rob a Phoenician trader. Horn calls his characters Saxons and Vikings although both of those races lived hundreds of years after the Romans invaded Britain. The story is just plain silly. I, who am a lover of medieval romances, sagas, and heroic literature, am having a hard time reading this. 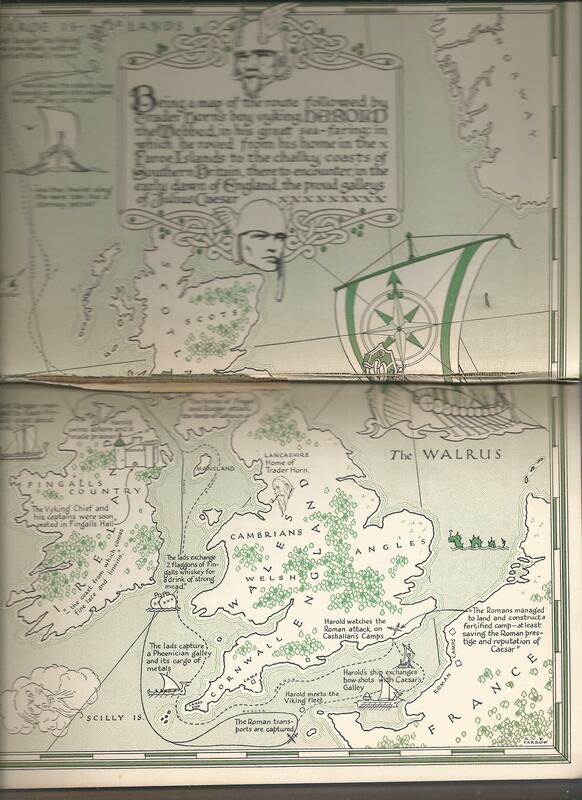 But the book came with this map. Isn’t it a beauty? The publisher did a nice job with this book back in 1928 when it came out. It is bound in green buckram, has gold stamping of a Viking ship on the front cover, `and the title stamped in gold on the spine. It’s only 275 pages, and most of the book is full of the ignorant and racist musings of old Albert Horn, but it’s printed on good quality paper, and a book like this might easily survive for a century or two if someone would just take care of it. I have a fairly large collection of old books. I’m thinking I might share a few more of their beauties with anyone willing to read these blogs. If I can just rescue the maps and some of the ancient illustrations from oblivion, it will be worth the effort. If you’ve ever seen the movie Trader Horn, or read anything by this old geezer, why not leave a comment? I’m fairly certain that Edgar Rice Burroughs would have been aware of Horn’s African tale at the very least. And I wonder how much more “White Hunter” literature survives from the late 19th and early 20th centuries. Don’t mention Haggard to me. I’ve read most of his stuff. But is there anyone else worth reading? About 9 or 10 years ago–it’s hard to remember that far back–I decided to scrap my old Tunnels and Trolls web page and start something new–an online club for all T & T fans. It didn’t take much thinking to come up with the name TROLLHALLA–a combination of the word Troll with the word Valhalla. And that is what the place would be–a sort of Valhalla for T & T players–a place to get together with friends, both for fun, and also to promote T & T.
An internet search showed that the name Trollhalla had been used once before at least–for a guest cottage in a tourist resort in Norway. Not much conflict of interest there. So, I used the name and for roughly 9 years Trollhalla was mine. 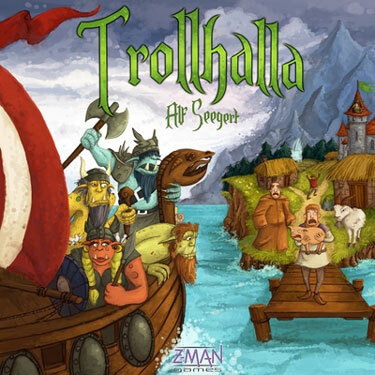 Then Alf Seegert, who had done a Bridge Troll board game earlier, decided to send his trolls plundering on northern seas, and came up with the name Trollhalla for his new board game. I have Google search words like Trollhalla for me every day, and when I heard about it, I wrote him a pained letter complaining. He and Z-Man were doing a game that swiped the name of my gaming club. It’s not a direct conflict, but it’s certainly a lot closer than the guest house connection. Too late! The game and the boxes for it were already in production. He couldn’t change the name. Alf and I made a deal. He gave me a copy of the game, and he joined Trollhalla as a member (haven’t seen much of him in 2011 though), and he explained the confusion between the names very nicely in a few places around the web. Ugh! I’m not real happy with the way that worked out–I kinda feel that Trollhalla is my name, but I didn’t trademark it or anything, and ideas should be free, and he certainly uses the word in a different sense than I do. Anyway, it’s an amusing board game, complicated enough that it takes some real study, or two or more playings to fully understand it–simple enough that you can stagger through a game and have fun even if you do get a few rules mechanics wrong on the first try. The trolls in the game are indistinguishable from 10th century vikings–yo ho, yo ho, a viking’s life for me! 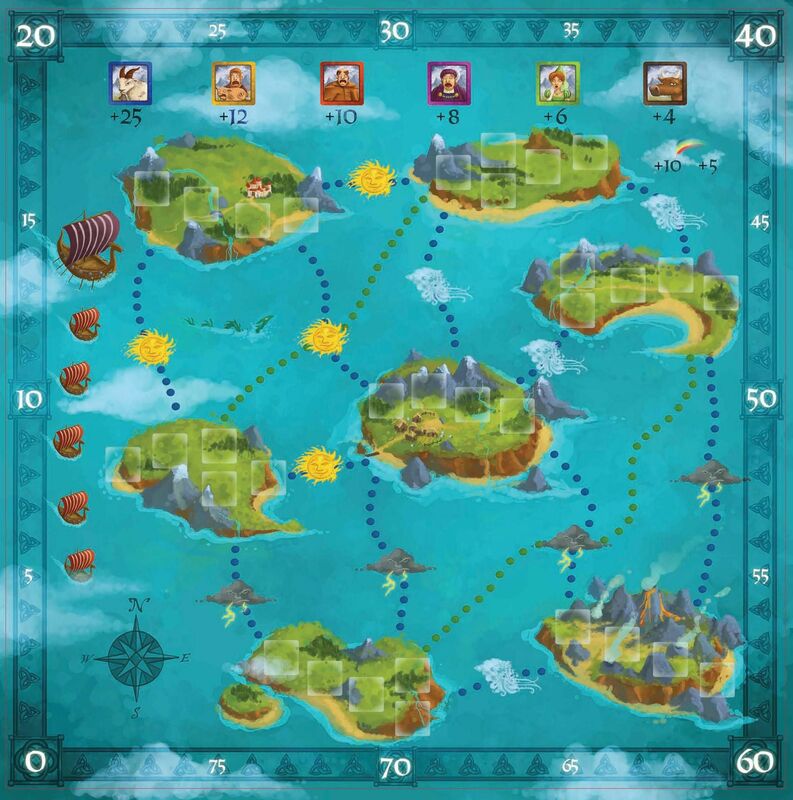 Sail from island to island, grab as much loot as you can, try to frustrate the efforts of other players. An hour later you’re done. Somebody won. It was probably close. You had a few laughs along the way. Trollhalla the board game is fun and funny–at least I enjoyed it when I played it. Seegert is an accomplished game designer, and board gamers should look for his work for some lighthearted entertainment. Ironically enough, for a game about ocean-going trolls, it doesn’t stand up to water very well. The first time I tried to play it, I accidentally knocked over a glass of water, and pretty much ruined half the paper components of my game. Arrrrgh! I can still play Trollhalla, but it is certainly the worse for wear. If you have played Trollhalla the board game, or are a member of Trollhalla the gaming society, go ahead an leave some comments here.